Borussia Dortmund have maintained their unbeaten record this season thanks to a 2-1 win over local rivals Schalke 04 in the first Revierderby of the season. It took less than seven minutes for Borussia Dortmund to take the lead to in the derby. The Black and Yellows have been famed for the free-flowing football this season, but their opening goal came courtesy of a smart set-piece routine which was finished off by Thomas Delaney. Roman Bürki produced a save of the season contender to deny Guido Burgstaller a certain equaliser mid-way through the first half, although the video assistant referee likely would have intervened for handball if the Austrian's strike had found the back of the net. Schalke were given a huge lifeline when VAR intervened to award the hosts what seemed like a fortunate penalty in the second half, which Daniel Caligiuri made no mistake with by sending Bürki the wrong way from 12 yards. 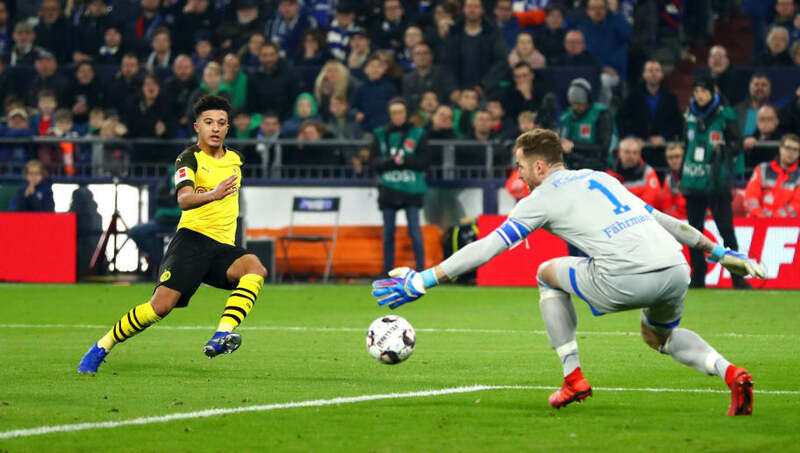 But Domenico Tedesco's hopes of snatching a point from the match were dashed when Jadon Sancho raced through to score a Thierry Henry-esque goal by curling the ball past Ralf Fährmann from a tough angle to ensure all three points returned to the Westfalenstadion. Don't you just hate it when fans start moaning about injuries as an excuse for losing a local derby? Well, in Schalke's defence, they might just have a point. Coming into the match, Guido Burgstaller was the only striker who was available for selection to Domenico Tedesco. So I don’t get why Tedesco would not sub in Konoplyanka for Burgstaller as Mendyl is playing in the striker position. The Austrian started alongside Weston McKennie in their attack, but Burgstaller was forced off through injury in the first half and Schalke were made to bring 21-year-old full back Hamza Mendyl on as a direct replacement. Fährmann (6) Caligiuri (7) Sané (6) Nastasić (6) Oczipka (6) Harit (7) Rudy (6) Schöpf (4) Bentaleb (5) Burgstaller (7) McKennie (5). Substitutes: Mendyl (5) Serdar (7) Konoplyanka (6). If your team's best player was taken off the pitch after 37 minutes, you know it probably wasn't your day. For Schalke, the few promising moments they had came thanks to the unselfish work of their only recognised striker, Guido Burgstaller. The Austrian certainly put in a shift on Saturday, and his importance to this side was highlighted most when he was forced off. Neither McKennie or Mendyl could come close to causing Borussia Dortmund any problems at the Veltins-Arena. Schalke certainly weren't at their best on Saturday, but no one was more anonymous than midfielder Alessandro Schöpf. The Austrian appeared to be happy to be a passenger on Saturday, failing to demand the ball to his feet and he was lucky to avoid being substituted by Tedesco. Lucien Favre's side have been making a name for themselves this season as a free-flowing, counter-attacking team who can blow sides away. During their biggest game of the season so far, however, Borussia Dortmund were able to get the upper hand in the match thanks to a smart set-piece routine. They've been able to make a real statement that they are not just a one trick pony but instead can cause teams a number of problems even when their quick passing isn't at its best. Bürki (7) Piszczek (6) Diallo (6) Akanji (6) Hakimi (7) Delaney (9) Witsel (7) Sancho (8) Reus (9*) Bruun Larsen (6) Alcácer (7). Substitutes: Guerreiro (6) Götze (6) Pulisic (N/A). One thing fans always look for is someone who knows exactly what it means to play in the biggest derby of the season. In Marco Reus, Borussia Dortmund have exactly that. The Germany international showed all his usual technique and class that we've come to expect from him over the years, but Reus steps up his tenacity against Schalke and he seemed to play at 110% against Dortmund's local rivals. He provided the assists for Dortmund's opening goal and popped up across the front three as he looked to find a winning goal throughout the second half. Reus was ultimately unlucky not to get on the scoresheet himself too, failing to find a way past Ralf Fährmann. Borussia Dortmund didn't have any players who stood out as poor performers during ther Revierderby, but defensive partnership Manuel Akanji and Abdou Diallo had such little work throughout the 90 minutes that they were caught napping at times. Schalke's best moments came up against the two centre-backs, but it's nothing more than a minor blip on what was otherwise a fantastic day for the visitors. Schalke will look to get back to winning ways when they take on Lokomotiv Moscow in the Champions League on Tuesday, although their match against the Russian giants will be somewhat of a free game as they've already booked their place in the knockout stages. Borussia Dortmund will also have a free shot in the Champions League against French outfit AS Monaco, a side who can't even qualify for the Europa League with a win on Tuesday.